A few evenings ago J and I had two of our best friends over for dinner in our new home. Although we moved in early December, we are just now getting settled and collecting furniture to entertain. In fact, our new dining table came in a week ago! We've been waiting to have guests over for dinner until our dining table arrived, so we we're very excited to finally have these two over to "mangia". The best part? They aren't only my best friends, but they are also our realtors! That's right. They helped us find this place we call home, so it's even more exciting that they finally get to see what it looks like with things in it. Don't get me wrong, this home is nowhere near being fully furnished and decorated, but sometimes hanging out with your friends is just more important. Tonight I cooked up this Cheesy Chicken and Broccoli Casserole I found on "Dinner at the Zoo". It was super delicious and got the stamp of approval by all who ate. The longest part about the recipe was waiting for the rice to cook in the oven, so just make sure to time it out right if you do have guests coming over. NOTES: I used chicken breast instead of bone-in, skin-on thighs. It was just as tasty to me, plus it kept me from having to go to the store just to buy chicken. I also used instant rice that cooked faster in the oven. I set to bake for 35 minutes, however, at 25 it was ready to go, so keep an eye on the chicken broth and if it looks to have boiled down, I'd pull it out of the oven. 2. Place a large deep skillet on the stove over medium high heat. Add the broccoli and ½ cup water to the pan. Cook the broccoli, stirring occasionally, until cooked through and crisp tender, about 4-5 minutes.Season with salt and pepper to taste. Remove the broccoli from the pan and set aside; remove any excess water from the pan. 3. Heat the oil in the pan over medium high heat. Season the chicken thighs on both sides with salt and pepper. 4. Place the chicken in the pan, skin side down if using chicken thighs, and cook until the chicken is a deep golden brown, about 5-7 minutes. Flip the chicken and repeat the process with the other side. 5. Remove the chicken from the pan and add the onion. Cook for 4-5 minutes or until onion is translucent. Add the rice, cooking for 1 minute. Place the chicken back into the pan. 6. Pour in the chicken broth and season with ½ teaspoon salt and ¼ teaspoon pepper. Bring the mixture to a boil. 7. Cover the pan and place it in the oven. Bake for 35 minutes or until liquid has absorbed and chicken is cooked through. 8. Remove the pan from the oven and place the chicken on a serving plate, cover with foil. 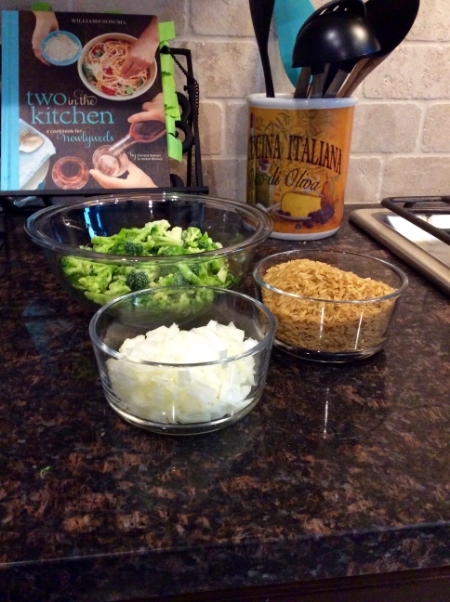 Stir the broccoli and cheese into the rice mixture and place it back in the oven. Cook for 5 more minutes or until cheese is melted. Good weather, good wine, good food, good company. These are a few of my favorite things! They just make a house a 'home', right?